Pancakes were a firm go-to during my university years. The overheads of life, paired with an income stretched thinly, honed my skills for scrupulous budgeting and seeking out life’s little luxuries. Enter fluffy, whipped pancakes; the kind which drew us all out of bed as the smell of melting butter wafted under our creaky wooden doors. A houseful of girls in our final year, we topped ours with syrup and fried banana, adding griddled bacon or vanilla ice-cream as a post-exam (or post dancing-all-night) treat. Contrary to the thick pancakes (or pikelets, as they are called in New Zealand) we devoured then, this recipe results in perfectly thin, french crêpes. They need nothing more than a dusting of sugar and a squeeze of lemon. I will definitely be whipping up some batter tomorrow evening, before we head out to watch the fireworks ringing in the New Year, so we can guzzle some for our first brunch of 2016. These crêpes feature all the good, proper stuff - flour and her pals butter, and sugar - and a secret ingredient: Belgian beer. Beer adds a sip of flavour, and the carbonation helps keep the batter supple. I came across this recipe from Jehnee Rains (thanks for leading me to it, Baked in Love! ), who was once head pastry chef at Chez Panisse and charged with developing the recipe for Crêpes Suzette. I have adapted it slightly as I found the batter a little to wet to work with. 10 minutes prep, best chilled overnight. Makes about a dozen. 1. Melt the butter and milk together starting on a low heat in a saucepan. Warming them helps the fats to spread evenly through the batter meaning the pancakes are less likely to stick to the pan. 2. Meanwhile, mix the flour, sugar and salt together with a large whisk or electric mixer. 3. Make a well in the dry ingredients, and pour in the oil and eggs while beating on a medium speed. 4. Once combined, slowly add the milk and butter until the batter becomes uniform. 5. Strain through a sieve. This seems a bit fussy, but it will help to ensure no lumps are hiding in your mixture. 6. Stir in the beer. 7. Let the batter sit overnight if possible, or at least for several hours. This helps the mixture to bond, and create flavour. 8. To cook, melt a knob of butter in the pan, and add ⅓ cup of batter when it is smoking hot. I re-add the same amount of butter each time I cook a new crêpe. Swirl the batter to create an even surface, and cook for two minutes. Little holes are ok. Lift to see if the crêpe is golden brown, flip, and cook for 30 seconds on the other side. Tip: I rustled up this recipe for Christmas morning. To keep a stack warm, I had a second large saucepan on the stove, half-filled with boiling water. I placed a plate on the top of the pan, and stacked the crêpes on it one by one, covering the top of the stack with the lid from the saucepan. It worked an absolute treat. Thanks Mama for the great idea. 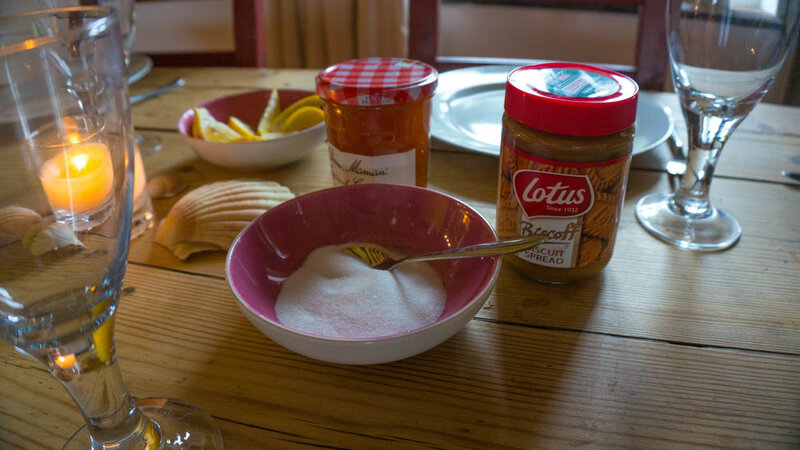 We served these with lemon and sugar, and some of Belgium’s famed Speculoos spread. Mimosas are a marvellous accompaniment.